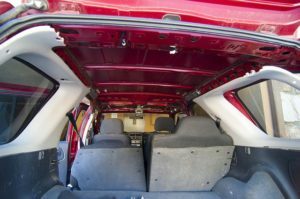 The headliner is used to provide insulation, visual enhancement, and protection just like door panels and carpeting in your car. 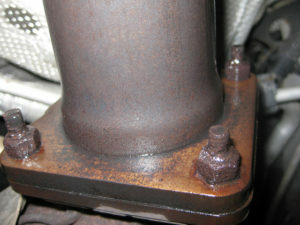 This part of the vehicle can have problems, such as sagging and this can be a nightmare for the car owner. It is also quite expensive if you do not repair it right away. Sagging of the headliner occurs because the glue of the car deteriorates over time. If the headlining gets wet, the original glue becomes moist and will eventually dissolve. In this case, you need the best adhesive for your car’s headliner. However, it does not have to break your bank. In fact, you can fix it or even replace the whole headliner with just the help of a headliner glue. What is The Best Headliner Adhesive in 2019? You cannot use just any glue though; it should be the best one for your headliner to make sure that it will last for years. There are several popular brands, but you should not just settle for the most affordable or the most widely available headliner adhesive. It is important to use the right type of adhesive, which should be designed for applications on automotive interiors. This way, the glue is compatible with the fabric and the vinyl materials of the car. It will also be able to withstand varying temperatures since the inner lining of the car’s roof can be subjected to hot and cold temperatures. To get excellent results for reattaching your car’s headliner, here are five of the best products that are specially designed for this kind of application. 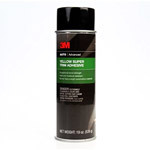 When it comes to headliner adhesive products, the 3M 08090 Super Yellow Trim Adhesive is one of the most recommended. It is a contact adhesive that is useful for gluing tops made from vinyl, as well as heavy headliners. It is also used for bonding hood silencer pads. These parts of the vehicle all require strength and resistance to heat, which is why this adhesive from 3M is a good option. 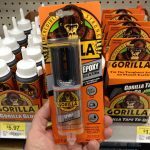 The product is available in an aerosol can that is convenient to use, weighs 1.55 lbs., and contains 19 ounces of adhesive. It is also very easy to apply as a spray-on adhesive with neoprene rubber as its type of adhesive. It simply attaches itself to vinyl and fabrics, such as the headliner of the vehicle. The 3M 08090 Super Yellow Trim Adhesive requires 15 minutes (at the most) for curing time and takes less than five minutes to dry. The set time required for the product is 24 hours, and as the product’s name suggests, the color when it dries up will be yellow. Before the product dries up, it helps to use the adhesive cleaner first. This spray-on adhesive is fast-acting, which makes it ideal if you are looking for a product that will help your headliner bond right away. It will keep your car top in place even if it is a heavyweight one. The product is also good for adhering either open or closed cell foams. Most people prefer aerosol adhesive products because they can tolerate changing temperatures better than other types of glue. 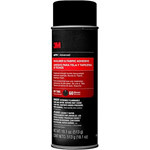 In the case of this 3M adhesive, the manufacturer claims that the product can take temperatures from -20F to 200F. In general, this 3M adhesive is quite easy to use. Make sure that you shake it well and hold the can at least six inches from the surface. Apply two or more coats uniformly, which should overlap each other. Give it at least four minutes to dry before you press on the surfaces together. You need to use pressure on the bond to secure it. Do so for 24 hours and try to apply on the surface if it is between 60F to 80F. Often, a common complaint of vehicle owners is that the adhesive they used only holds for a few days or weeks. After that, when their cars are subjected to high heat, their headliners start sagging once again. Therefore, they either need to reapply the adhesive, or they have to replace it. For those whose problems are the same as the mentioned situation, the DEI 010490 High-Temperature Spray Adhesive may just be the answer to this common issue. The DEI 010490 High-Temperature Spray Adhesive offers high strength bonding. You can use it on a wide variety of materials, such as foams, fabrics, and trims. Unlike most other products, this high-temp adhesive uses a three-way valve that is specially designed and is adjustable as well. The valve allows the user of the product the kind of spray pattern that is most applicable for the job. If you have problems with your past adhesive, which may not have done its job once the headliner gets exposed to high temperature, this spray adhesive may be what you are looking for. It promises to provide bonding effects for very high temperatures up to 160F or 71C. Aside from being resistant to high temperatures, this product also forms a bond that is resistant to water or moisture. You can also use the spray adhesive on the DEI Heat Screen. 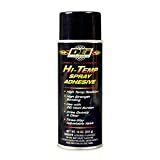 Just like the 3M product above, the DEI 010490 High-Temperature Spray Adhesive also comes in an aerosol can, which provides convenience for use. However, the product is applied liberally on both surfaces for it to work. To use, you should clean the surface first and make sure it is dry before applying. It is also important that there is no dirt, grease, wax, or any other substance on the surfaces of the application process. Permatex 81850 Black Super Weatherstrip Adhesive, 5 oz. The headliner adhesive you choose does not have to be super expensive. With the Permatex 81850 Black Super Weatherstrip Adhesive, you may be able to fix that sagging headliner fast, easy, and without spending too much. Other products use different colors that may not match with your car. However, this product uses black, so that it can blend with your auto, lessening the need for cleanup after application. Additionally, the Permatex 81850 Black Super Weatherstrip Adhesive enables the user to reposition the parts even after contact is made. Aside from the features and capabilities, the adhesive is also useful for those who are worried about high heat or cold temperatures. The adhesive can withstand extreme heat and is also water resistant. It is also resistant to solvents, along with kerosene, gasoline, and antifreeze. The manufacturer recommends using the adhesive on cut gaskets and moldings of car trunk and door. 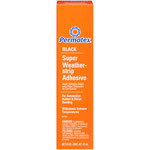 When using the Permatex 81850 Black Super Weatherstrip Adhesive, it is important that the surfaces it will be applied on are cleaned thoroughly. A thin, the even coating should be applied on both surfaces, and they should be allowed to dry before bonding them. Another thing of coat adhesive should be applied before bonding right away. It is important that the adhesive is not applied on painted surfaces that will be exposed to the sun or is uncovered. 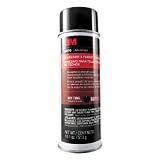 3M 38808 Headliner and Fabric Adhesive - 18.1 oz. The 3M 38808 Headliner and Fabric Adhesive is quite useful if you are looking for a formula that can bond your headliner as well as other materials in your vehicle, such as foam, plastic, fabric, and even metal. 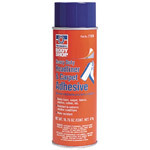 The headliner adhesive product comes in an aerosol can that allows the user to spray in a controlled and even layer. This way, the surfaces may bond without problems. The product weighs 1.43 lbs. and is mostly used for gluing automotive trims, fabrics, and headliners. Chemically, it is made up of solvent and curing time takes about 30 minutes. The product’s total drying time can take as long as an hour but will not stain because the dry color is clear. 3M 38808 Headliner and Fabric Adhesive can also resist effects of heat, cold, humidity, moisture, and the other effects of environmental conditions. The manufacturers recommend the use of the adhesive for installing fabrics in the vehicle as they claim that it is specially formulated to create a strong bond to the fabric without staining or causing discoloration. The aerosol spray can distribute a consistent layer of coating of the adhesive so that you do not have to worry about oversaturating the surfaces. The product also comes with an adjustable nozzle, which provides help in applying the adhesive on the parts of the vehicle. Although the drying time can take from 30 to 60 minutes (depending on the conditions of the environment), you can use the extra time to complete other tasks you may have to do for your vehicle. The product promises to set fast enough, especially if you only have a short time for the completion of your vehicle restoration project. If your headliner has loosened or has become detached, the Permatex 27828 Body Shop may just be what you need to fix the problem. 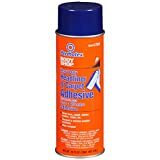 It is a high-strength adhesive that comes in an aerosol can and is useful for those looking for a product that can help their repair the interior parts of their vehicle. Aside from the headliner, you can also use this adhesive on carpets as well as the interior door panels and the trunk linings of the vehicle. It can resist high temperatures and is also water resistant, which is useful for those who live in regions with wet climates. Similarly, this glue can be used to attach upholstery cloth for boats, as well as carpets, floor mats, and insulation. The product can be applied to the kick and silencer pads, which can be bonded to wood or metal. The product weighs 1.40 lbs. and is mostly used to bond automotive materials as well as foam, fabrics, and rubber. Chemically, it is mostly comprised of acetone and has an amber finish although the dry color is straw. Curing time is quite long, which is typically four hours. For the product to dry, it will require 24 hours but the set time takes about five minutes. It is important to note that the Permatex 27828 Body Shop may attack painted surfaces as well as plastics. For these surfaces to stay unaffected, you should protect them using masking tape. You can remove the tape immediately after you have applied the product. In order for this upholstery glue to work, you should follow its instructions thoroughly. Just like with other adhesive products, the surfaces in which this particular adhesive will come in contact with should be completely clean and free from any contaminants. Before using this headliner adhesive, you should shake the can first before turning the nozzle. It has three spray pattern widths for you to select from low, medium, and high. You can choose from them depending on the surface where you will spray. 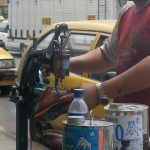 It is advised that you hold the can at least six inches from the surface and then apply a maximum of three overlapping coats uniformly. Make sure that you wait at least five minutes before you reapply in between the coats to allow the adhesive to dry. Another tip is that you should apply on both surfaces so that the adhesive will provide you with a stronger result. When applying additional coats, the second one should be in the opposite direction from the first coat. Do not forget to allow the adhesive to dry, which generally takes five minutes (or until you see that the adhesive is tacky). After that period, you can set the material. The next step is for you to press the surfaces together. To eliminate air pockets, make sure that you apply even pressure. The bonds will typically be made within 30 minutes, but the full cure can be achieved after 24 hours of application at 70F or 21C. Headliners do not last forever, just like the other parts of your car. You need to take care of them to keep enjoying their services, which may include sound reduction and aesthetics. As the headliner grows old, it may start to come off the roof or sag. If this becomes a problem, you may have to replace it or simply apply a good headliner adhesive, so that it will stay on the car’s ceiling just like it should. The adhesive you choose should be designed for headliner use. Typically, they come in spray cans, so you can easily apply them. The right adhesive product will help restore your headliner not just for a few months but for a long time. This can help you save a lot of money since you do not have to replace the whole thing. Check the features of the product. When you shop for an adhesive, you will see that they have numerous features, but these are the most important ones. Resistant to high and low temperatures. The interiors of your vehicle can be hot or cold, so make sure the adhesive is temperature resistant. You should never go for a rubber-based adhesive because it will easily melt when exposed to heat, causing the headliner to sag or even fall off. Stronghold: If it cannot hold the headliner well, you will have to keep reapplying the adhesive. It is not only time consuming but also requires a lot of effort on your part. Usable on fabric and vinyl: Many adhesives will tell you they are compatible with a lot of materials but if you do not see vinyl and fabric in the list, skip that product. Headliners are mostly made of vinyl and fabric so it would be useless if the adhesive does not support these two materials. Should you go for aerosol or liquid adhesive? The adhesive can either be liquid or aerosol. Both of them you can use for vehicle headliners, so you can choose whichever you prefer. Liquid headliners can be used with a paint gun, while aerosol adhesives are in aerosol cans that have been modified for easy use. You only need to remove the cap and begin using the spray. If you do not have a paint gun, an aerosol adhesive may be more convenient for you. When searching for the right adhesive, take note of the tips mentioned above so that you do not have to buy another product or waste more time in restoring your vehicle’s headliner. Is there a need to remove the headliner before using the adhesives? While it is not required to remove the headliner of the car to bond it with another material, it would make the job much easier if you do. Just take out the screws to detach it from its clips. You can use a flathead screwdriver to pry it off. You can apply the adhesive to the headliner and the foam below it. If necessary, can you reposition the headliner? Some adhesives can bond on contact, while there are others that allow the user to reposition the headliner if needed – as long as it is still wet. You will usually have a few minutes before the adhesive becomes tacky. Once it does, you will not be able to move the item. How long will it take for the adhesive to dry and how many cans will you need? The amount of time required for drying will depend on the adhesive and its composition of materials. Normally, it will take about an hour or less before it bonds, but there are also others that require a whole day before it dries. You will need to apply pressure on both surfaces to make sure they bond well together, and there is no need to redo it. The number of cans you need for reattaching the headliner will depend on the restoration project itself. However, you would usually need two to three cans if it is a full-size headliner. Some headliner adhesives may work for other people but not for you. It is always useful to check what the product is for, including its recommended applications. 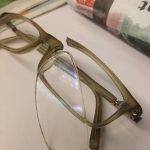 The process of using the adhesive on headliners is not as complicated as it seems, but it is important to read the instructions provided by the product’s manufacturer for best results.